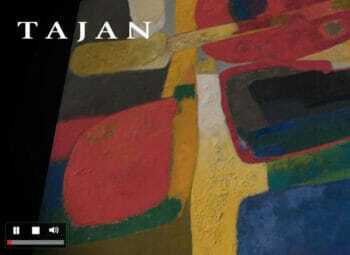 Lausanne based platform ARTMYN (artmyn.com) is a pioneer in the digitalisation of Fine Art. Using a new generation of scanners and algorithms, this startup is making art increasingly accessible. ARTMYN technology is also able to extract the DNA from a piece of art to detect any damages, facilitating the preservation process. 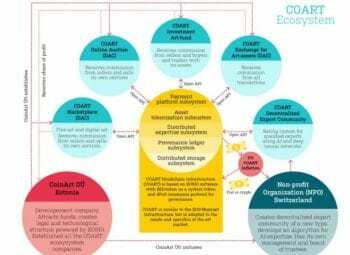 Co-founder and Chief Technology Officer Loic Baboulaz talks us through the workings of ARTMYN. Lovely to speak with you, what is the aim of your company and how did you first come up with the concept behind ARTMYN? 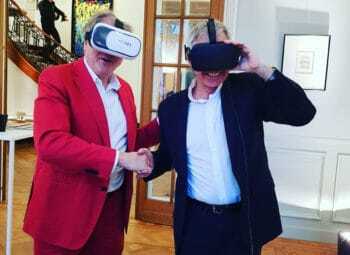 ARTMYN initially started as a 3-year academic project (https://lcav.epfl.ch/research/eFacsimile) led by Professor Vetterli and I at the Swiss Institute of Technology of Lausanne (EPFL) on a research grant from Google. The goal of the project was simple: how can we improve the perception of Art on modern digital technology? While working with various art forms, ranging from stained glass to print works, we looked at what makes a visual experience great: namely the interplay of light and matter that our eyes capture. When looking at a 2D image of an artwork, the vital element of materiality is missing: how can you understand and assess an artwork when you only see a single image of a very complex object like a painting? Imagine for example, that you are looking at Gustave Klimt’s painting The Kiss for the first time: are the yellow details you see gold leaf or yellow oil pigment? Without additional information, it is impossible to tell. ARTMYN is radically changing the visualization of art online by allowing the perception of an artwork in its entirety. Pigment, surface topography and materiality of a work are all translated, allowing you to manipulate the artwork as an art expert would. ARTMYN, with its new digitization technology producing interactive high-resolution images, enables for this to happen. Accessible on any browser, our web visualization application is interactive, real-time and multimodal: the viewers can manipulate artworks as if they were in their hands: tilting, zooming and rotating freely the digital twin, but also changing the position of light to enhance a particular detail, or even switching to UV illumination to reveal the invisible. All this is now possible without any risk to the original object! 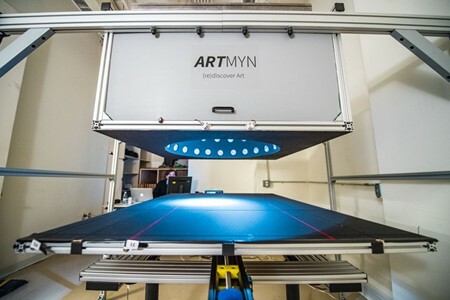 In addition to its unique digitization technology, ARTMYN offers different solutions for artwork security and artwork promotions like automatic damage detection, interactive e-catalogues, video maker, or art passport. ARTMYN is a leading startup, linking art, science and technology. 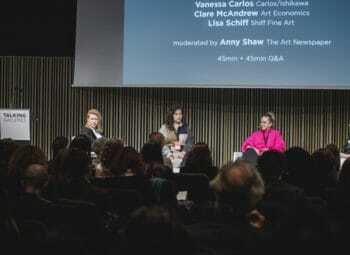 How does the use of DNA extraction revolutionise the preservation of art? Is it a difficult process? Our technology is purely image-based and relies on computational photography algorithms. The level of detail and amount of information that we capture is such that a copy of an artwork (even made by a machine) can be distinguished from the original if both are scanned with our technology. As well as this, two scans taken at different moments in the life of the painting can be cross-examined algorithmically to produce a list of alterations, some of which can be labelled as natural negligible changes and others as potential damage. The process is very complex in many respects and that is the main reason why ARTMYN carries out all steps of the data flow: from building high speed scanners for data acquisition and data processing in our private datacenter to data streaming to our web viewer. The number of images is phenomenal and has not yet been seen in the art world. For example, up to 100K images when scanning a 2mx2m painting generating several terabyte of data. To give some perspective, a professional DLSR camera has a shutter life of approximately 200K images, so the equivalent of 2 paintings digitized by ARTMYN. Handling the creation, transmission and processing of such big data is critical and has a large impact on the hardware and software choices we make. ARTMYN created the first “Biometric Passport for Art”, could you tell us more about this? The biometric Art passport will be launched officially this year and will add transparency to the art market and private sales. Generally speaking each art passport is a secured private electronic document linked to a unique artwork and accessible by the art owner or collection manager via a secured platform. For many legal and privacy reasons, ARTMYN does not store any information that can identify the owner. A passport itself can record all kinds of information pertaining to an artwork that the owner has: authentication certificates, condition reports, exhibition history, restorations etc. The biometric content of the passport is generated when the artwork is scanned with our technology and relates to the high resolution multidimensional images. While being private, the passport can nonetheless be shared securely to a potential buyer for perusal and accessing our unique visualization of artworks. With art it is often those who have properly noted and kept receipts from all the events throughout the life of an artwork that are the ones who have taken exceptional care of their collection. The art passport plays this role by providing a secured medium between buyers and sellers, creating a feeling of reassurance and confidence. The platform uses interactive images and video. 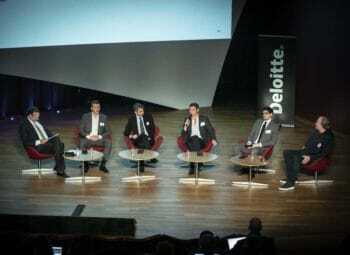 What are the advantages of using 5D technology? Do you think it has changed the way people view art? Without a doubt! Every week we receive emails from art lovers who are completely astounded when they discover us and start interacting freely with the artworks made accessible through our website. Our visualisation application reshapes the way we interact with artworks and reinstates the perceptual richness of an original work that is lost in a single photograph. 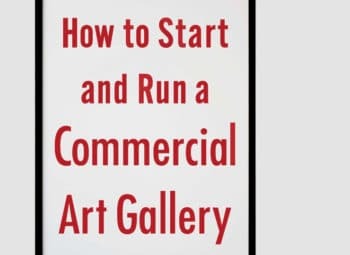 The large majority of art lovers will probably never have the chance to physically hold a work by famous artists like Turner, Tiepolo or Soulages. yet, with ARTMYN, it has now been made possible to admire such paintings from the comfort of your own home. Discovering a given artwork through active manipulation brings a greater experience and pleasure than remaining passive in front of an inert, flat image. This novel way of readily viewing art has been welcomed by the general public, art lovers and youth. In 2016, a research study was led by Professor Mohr from the University of Lausanne to evaluate the cognitive and psychological impacts of looking at an artwork with our technology versus a standard image or the actual artwork. Results were fascinating and showed that aesthetic appreciation, recall in memory and experience intensity were all enhanced with our interactive technology, irrespective of age and cultural background of participants. 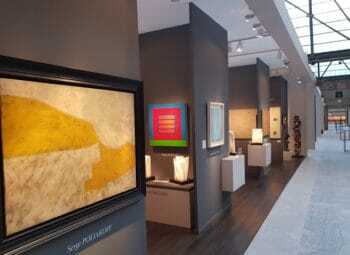 You have developed a partnership with renowned international auction house Sotheby’s. In what ways do you aim to collaborate? Are there any other art organisations that you would like to work with? Collaborating with Sotheby’s is a fantastic opportunity as it allows us access to their wonderful collections. This month we are honored to be welcoming Grégoire Debuire to our team, former Christie’s director, as our new Chief Business Development Officer. Auction houses are an important segment to our business and we will be announcing more collaborations in the near future. We are also very excited to have announced a new partnership with the Freeport of Geneva earlier this year, opening a new scanning center in their premises this month. 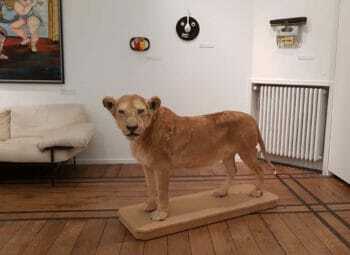 The world of art is captivating and we are always excited to hear from small or big collectors, family office, foundations, insurances galleries or museums. 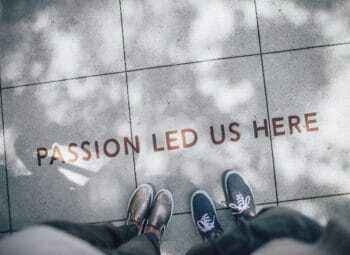 What is your vision for the future of ARTMYN? ARTMYN is growing fast and may well become the norm for viewing art online. 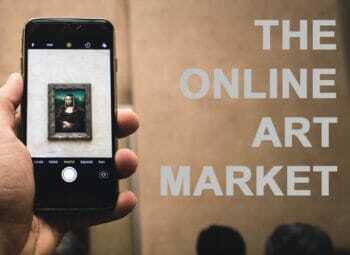 Not only because of its fantastic possibilities to view and promote an artwork online, but also for the added value of capturing a fingerprint at any given moment in time. 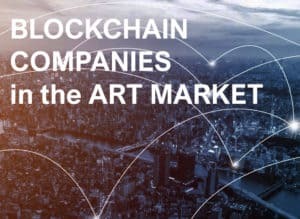 Apart from New York City, ARTMYN has mainly operated in Europe and I expect that very soon it will be operating in both America and Asia where the art market is booming. As a scientist, I anticipate that many areas of research, whether in art, image processing, machine learning or social science, would benefit greatly from the unique data we are able to acquire. Collaborations to this end with research groups throughout these worlds would be fantastic.